The @DavidGeurin Blog: Why the never-ending pressure for kids to learn more, younger? Why the never-ending pressure for kids to learn more, younger? Of course, we want students to be challenged and to achieve their potential. But it seems there is an unhealthy press to have kids learn more, younger. Elementary students write research papers instead of personal narratives. Algebra I happens in 8th grade, or even 7th some places. Some students are graduating from high school with upwards of 30 hours of college credit. Confession: Dual credit has saved our family a ton of money on college tuition so it's hard to be critical here. But I have to wonder what is the point of all this? Is this what is referred to as the human race? What are we racing against? Life expectancy is steadily increasing right? We have MORE time to reach our life goals last time I checked. With the recent ESEA Reauthorization (goodbye NCLB, Race to the Top), it seems some of the madness may be ending, at least from the standpoint of federal policy. For some reason, policymakers seem to think raising standards will "fix" education. But higher standards don't necessarily result in better learning for kids. Great learning is about developing great teachers, great schools, and stronger communities. An ineffective teacher or school will still be ineffective even with higher standards. Change happens when the process changes, when educators change how they do business. So maybe instead of pressing more curriculum down on youngsters, we could make learning more personal and meet the needs of individual learners. Some kids will read in kindergarten, or even earlier. Some kids might benefit from Algebra I in the 8th grade. Some kids need more time but will get it eventually. Teach students first, curriculum second. So we don't need to hurry learning. No more pressing. 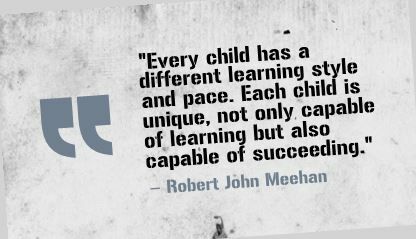 Create great learning environments and experiences and allow students to find their passions and become adaptable, lifelong learners. Maybe there is still hope for finger paint. And learning to be kind. And just being a kid. Question: What are your thoughts on kids learning more, earlier? Leave a comment below or share on Twitter or Facebook.